As we’ve traveled, we’ve discovered quite a few tips and tricks along the way. One of them is (if you have the flexibility) to travel to popular places in the off season. 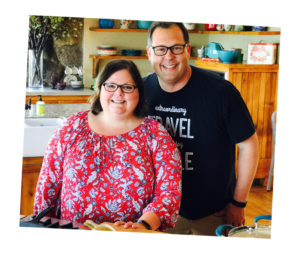 This fall, at the end of the busy tourist season, we had a chance to visit Clear Lake, Iowa, on a hosted visit. We had a great time there and have put together this list of 10 things to do in Clear Lake in the off season. We’ve written about this local gem before, but love it so much we thought it was worth mentioning, again. 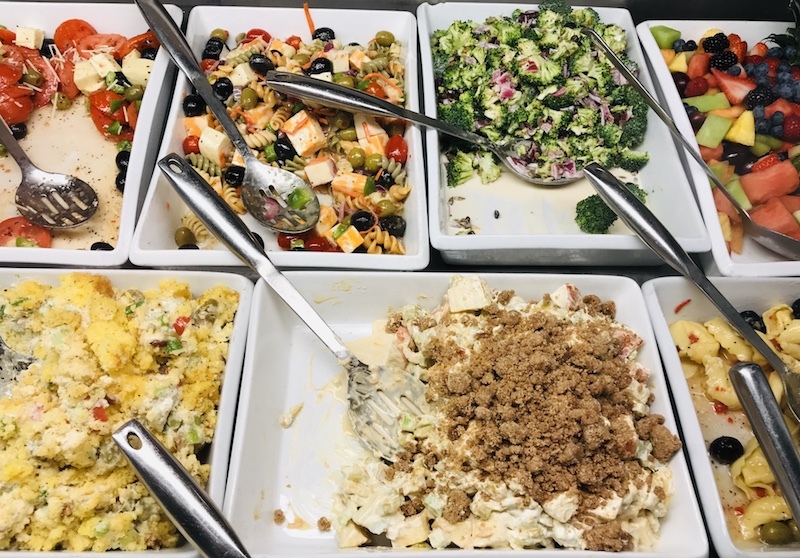 If you’re anywhere near Clear Lake, plan a stop at this deli for a sandwich piled high with fresh meats and cheeses, hot soups, and great salads all served next to copious quantities of desserts that are made fresh daily. Plus, the folks inside are so nice you’ll feel like you’re visiting old friends when you go there. Pro tip: If it’s hot beef sandwich day, go early — it sells out fast to locals who know just how good it is. 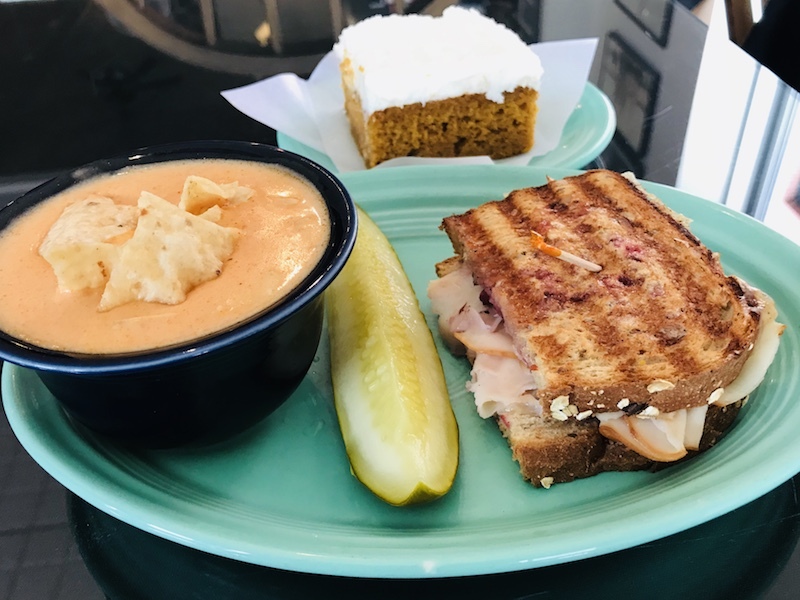 Fall is a great time for lunch at Starboard Market with warm soups and sandwiches and their pumpkin bar. Starboard Market always has a cooler full of unique and delicious salads. The Lakeside Inn is a historic hotel located right on the shore of Clear Lake. We truly appreciated the complimentary night there while we visited Clear Lake. 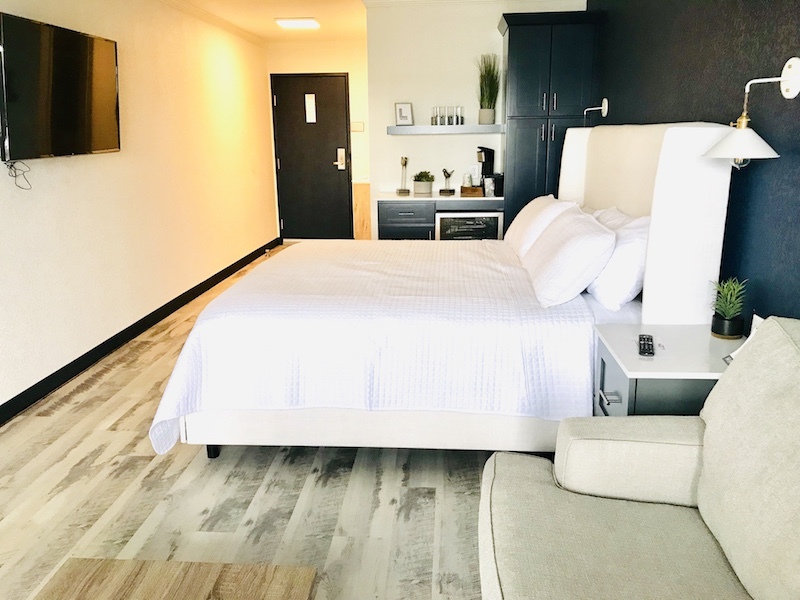 The decor of the hotel is just what you’d want in a beach house, and the recently renovated, clean room had all the amenities we wanted as well as a very comfortable bed. The hotel is right on the lake, so we had a gorgeous view out our window as well as direct access to the water. In summer months, guests can rent a pontoon boat and enjoy a meal at the hotel’s restaurant/bar located right on the water. 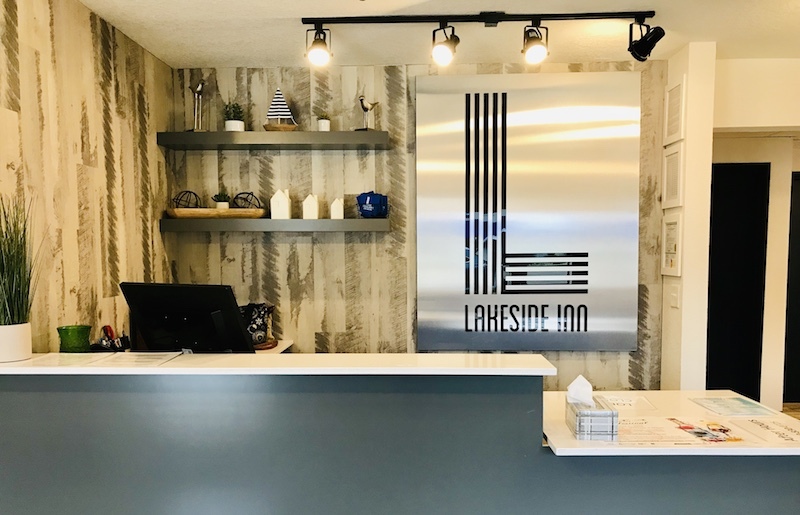 Newly renovated rooms at Lakeside Inn in Clear Lake now have fresh and modern designs. Lakeside Inn is open year-round with discounted rates in the off season. No list of things to do in Clear Lake would be complete without a stop at The Surf Ballroom. This venue is among the most famous landmarks in Clear Lake. 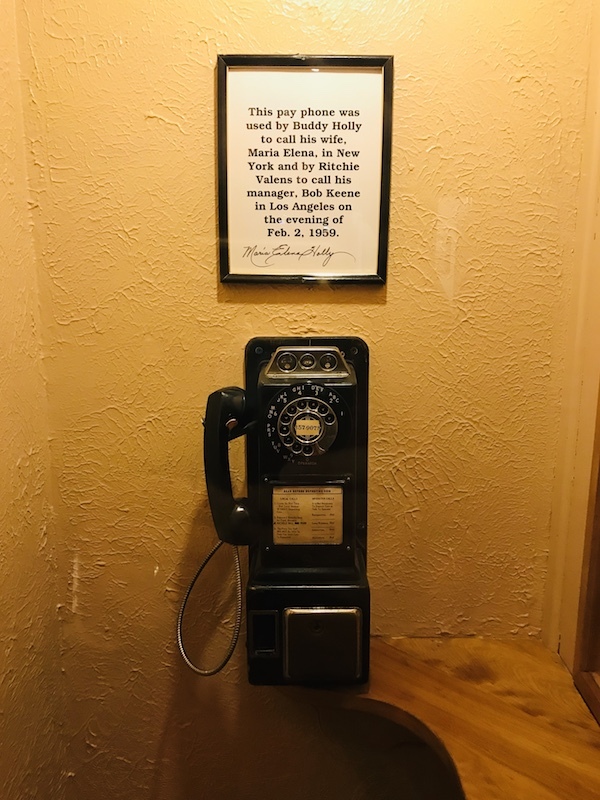 It’s the last place where Buddy Holly, J.P. “The Big Bopper” Richardson, and Ritchie Valens performed before boarding an airplane that crashed shortly after takeoff from the Clear Lake airport. At the Surf Ballroom in Clear Lake, Iowa. It’s also a living museum full of music memorabilia. It’s fun to walk out on the stage and stand in the same place as countless musicians. 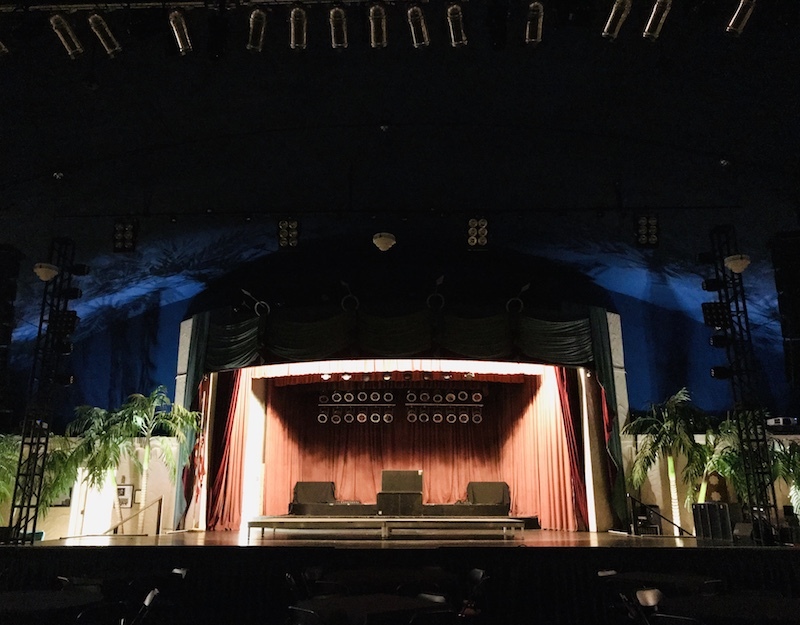 The last stage on which Buddy Holly performed was this one at the Surf Ballroom in Clear Lake. At the end of January and into the first part of February, Clear Lake hosts the Winter Dance Party, an annual tribute to the lives and legacies of the three performers who perished in the fateful plane crash, the “day the music died.” Pro tip: be sure to check out the green room there and see the walls signed by the thousands of performers who have crossed the stage. You’ll be amazed at how many you recognize. Trust us, there are no shortage of good places in Clear Lake. We loved our dinner at the Half Moon Inn. 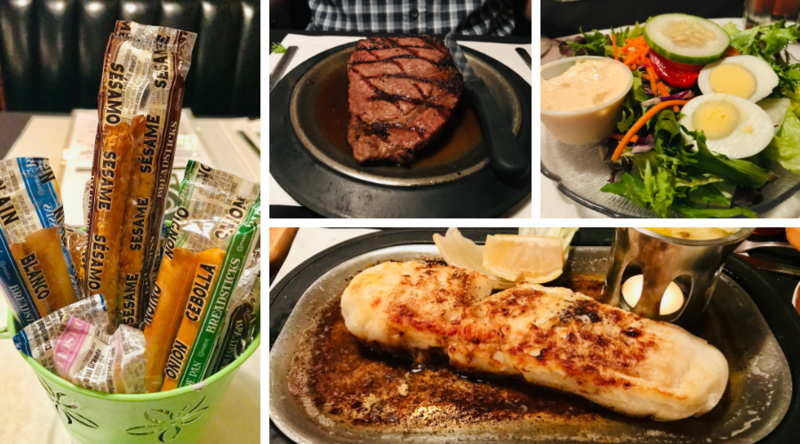 This little joint is a classic steakhouse right out of the 1970’s. From the outside it doesn’t really look like a restaurant, but on the inside the locals enjoying great steaks, well-prepared monkfish, and delicious cocktails let you know that you’ve just found a great restaurant you’ll remember. The best part is that in the off-season it’s much easier to get a table at this popular local eatery. For breakfast suggestions, we asked around and everyone we talked to said we had to try the 7 Stars Family Restaurant. We’re glad we did. 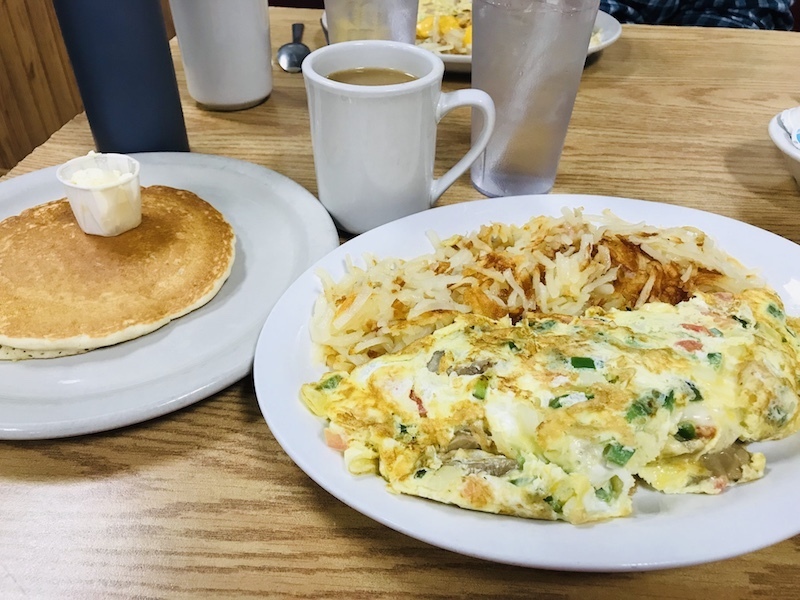 We loved our down-home style breakfast served to order with all of our favorite sides like hash browns and buttermilk pancakes. Pro tip: The portions are huge, so come hungry. 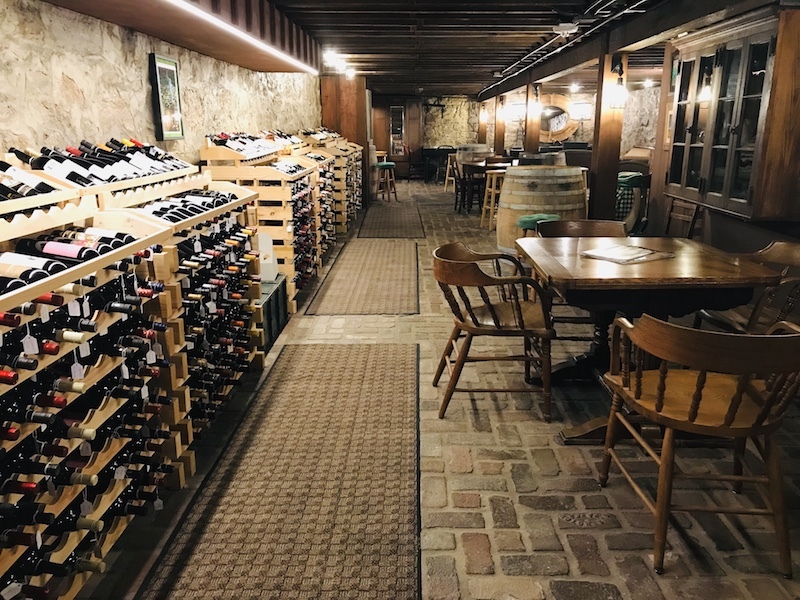 In a beautifully renovated building in downtown Clear Lake, K & B Emporium offers visitors a huge wine selection, along with clothing and decor items, as well as a cafe. Have a cocktail or a glass of wine before heading upstairs to Anna’s Ballroom, a fine dining establishment on the second floor. K&B Emporium offers shopping, food, and this incredible wine cellar. Also, plan time to enjoy Lake Time Brewery, Clear Lake’s own craft brewery. On tap there are local year-round favorites as well as seasonal offerings, all expertly brewed and available to enjoy at the brewery or in a crowler to take away. Three seasons out of the year you can walk through Clear Lake’s beautiful Central Gardens of North Iowa. 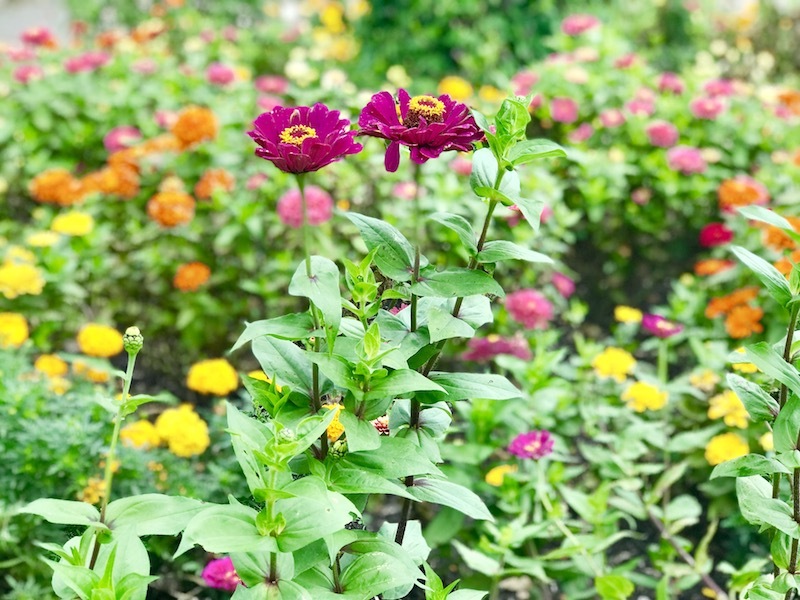 Centrally located, this volunteer-maintained garden is a well-designed, wonderfully groomed patch of beauty in this north Iowa town. Stroll the paths and bask in the beauty of the spring, summer, and fall plants and flowers throughout the garden May 1- Nov. 1 each year. 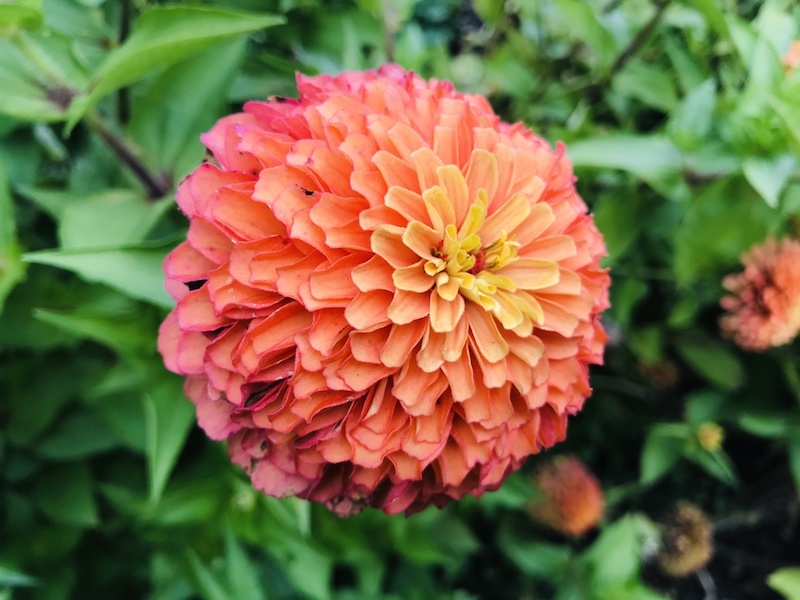 Even in September, flowers like this one were blooming at Central Gardens. Central Gardens of North Iowa is maintained by local volunteers. 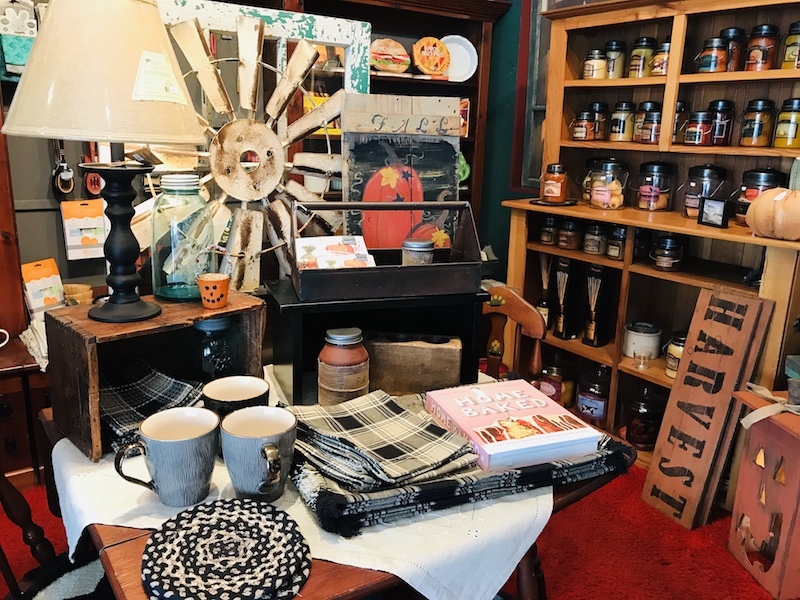 With antique shops, home decor boutiques, drugstores and clothing stores, Clear Lake offers visitors great shopping opportunities the whole year through. Around the holidays, the downtown area really comes to life with beautiful decorations and stores offering great specials. A visit to this quaint city-center is a must for any visitor to town. The Red Geranium has beautiful seasonal home decor and fantastic staff to help you find just what you need. 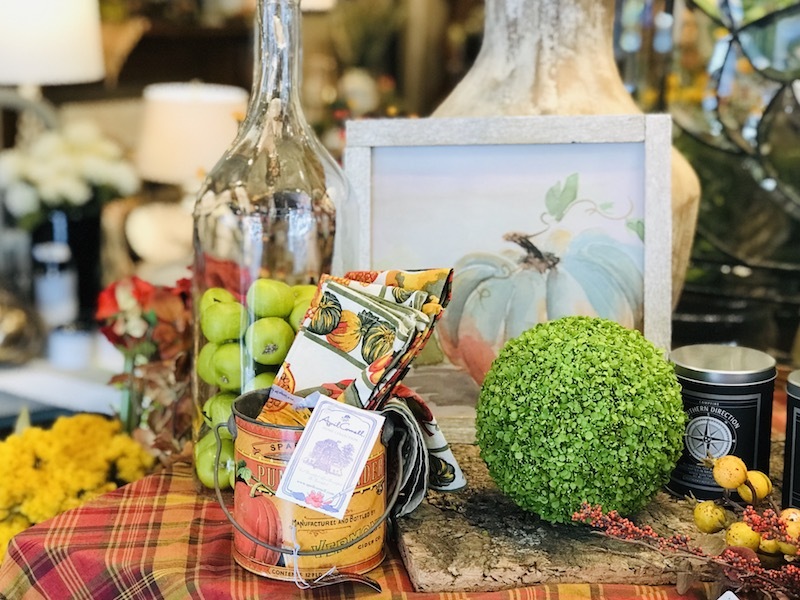 Ralphene’s has home decor, gifts, and so much more. 8. Take a cruise on the Lady of the Lake. 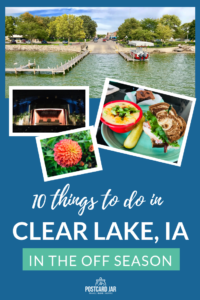 Something that’s been on my list for a long time is a cruise on Clear Lake aboard The Lady of the Lake, a paddlewheel boat that sets sail twice daily from May – August. I’d wanted to try this for a long time because I love any chance to get out on the water. We boarded the locally famous sternwheeler on one of the last days of its season in late September. It was wonderful because we had our pick of great seats, no line at the bar, and we even got to talk to the captain. We enjoyed our tour along the lake’s shore and the opportunity to take in the views and history of this gem of a town without other boats zooming around. Such a lovely way to spend an afternoon! 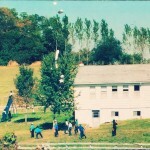 All across Iowa, artist Ray “Bubba” Sorenson II has been installing Freedom Rocks. These pieces of art are designed to promote tourism while thanking veterans for their service. The artist’s goal is to place a rock in each of Iowa’s 99 counties. 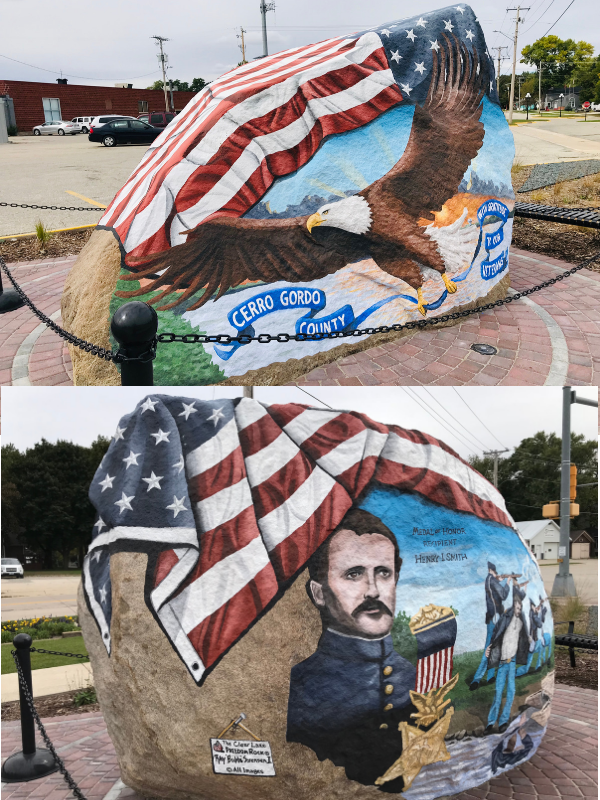 Clear Lake plays home to Cerro Gordo County’s rock. 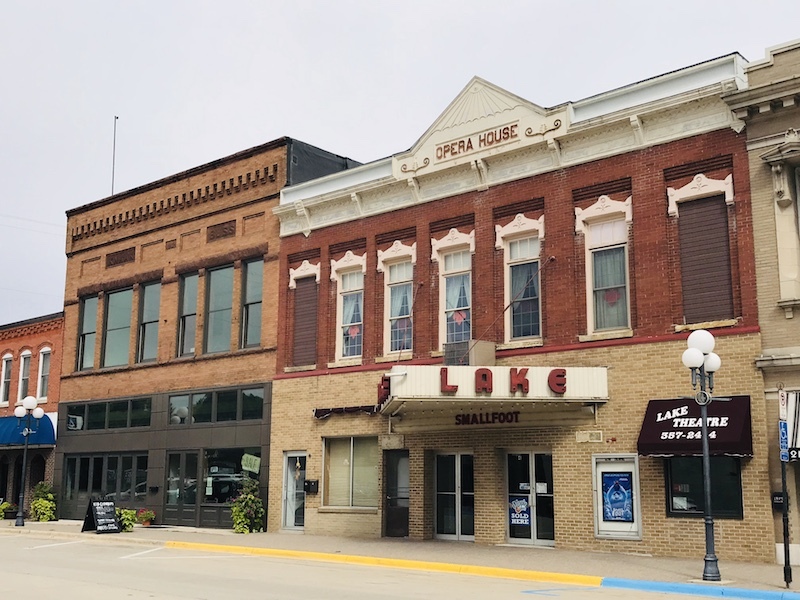 The Lake Theater is a classic American single-screen movie theater located in the old Clear Lake Opera House built in the 1890s. Take a step into the past and away from the crowded multi-plex as you sit and enjoy a current Hollywood release in a historic theater. The Lake Theater is located in the old Clear Lake Opera House. While a good start, this list is by no means complete. For instance, the Color the Wind Kite Festival happens each February in Clear Lake. While we have not been, it is definitely on our list of things we’d like to see someday. For a complete list of all the goings-on in Clear Lake, visit their Chamber of Commerce calendar HERE. 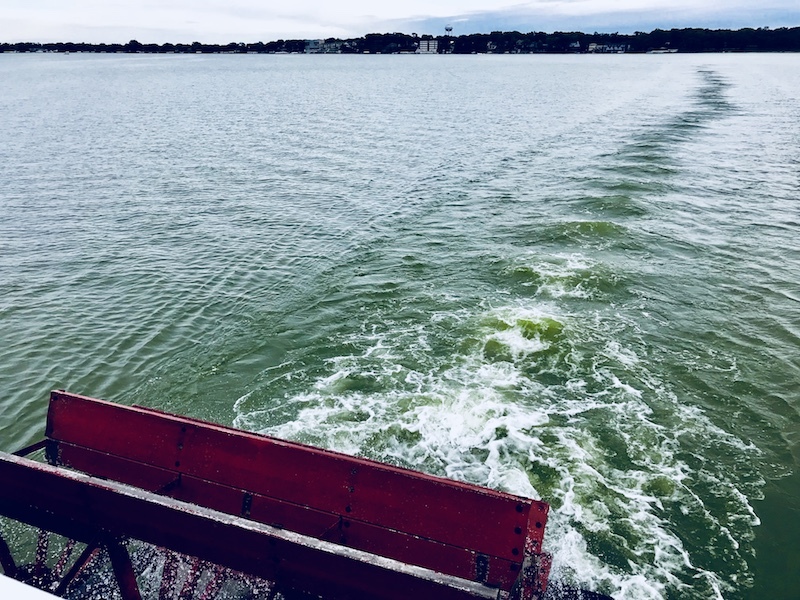 While our visit to Clear Lake, Iowa, and our night at the Lakeside Inn were complimentary, the opinions expressed and the constant craving for a Starboard Market sandwich are our own.